The V28 Mill Training Professor is a comprehensive training solution designed to help you master your CAD-CAM CNC Mill programming. 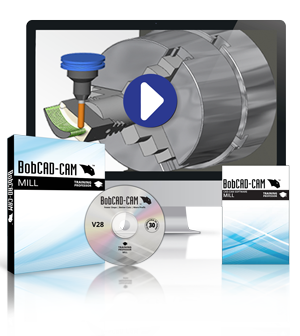 The learn at your own pace video series covers all of the time saving tools and advanced machining functionality within the BobCAD-CAM software for milling. The video series provides how-to instructions on using the new V28 CAM features for Mill programming. Additionally, it covers the innovative features that BobCAD-CAM has developed over the past 30 years, including the software’s wizard driven interface, Dynamic Machining Strategies™, 2-5 axis high speed adaptive toolpaths, simulation features, and much more.